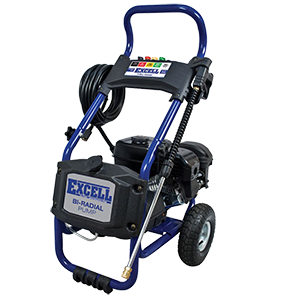 Excell 2700 PSI pressure washer is a maintenance free unit; equipped with a bi-radial oil-free Excell pump. Ergonomic wand is rust resistant and contains 5 quick connect nozzle tips to customize the unit to best fit the cleaning project. Home cleaning, dirt, mold, mildew and paint removal can be stressful, time consuming and difficult only if you do not have the right pressure washer. With the right pressure washer at hand, it becomes very easy for you to do professional cleaning around your home. There are different brands and models of pressure washers. But they are not of equal rating and quality. If you are looking to buy a pressure washer to enable you get the best cleaning result around your home or business premises, you may consider buying Excell PWZ0142700.01. Read on to know more about this model of best Excell pressure washer. 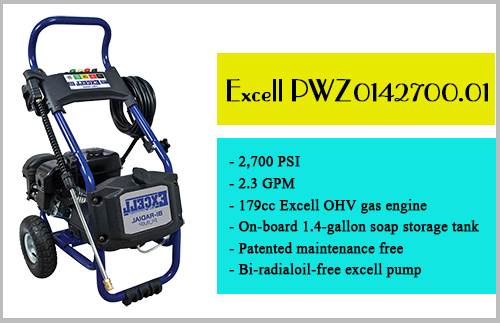 Equipped with 179Cc Excell OHV gas engine, this model of PWZ0142700.01 is created to deliver high cleaning results to the users. The engine is capable of producing a torque of 2,700 PSI 2.3 GPM. With such a power, you will be able to wash your vehicle in and out, clean your patio furniture, driveways, deck, window side and remove mold and mildew from a wall. The pressure washer is also capable of removing paint and thus it can be used to prepare the wall for painting. Excell PWZ0142700.01 comes with features that offer comfort and ease-of-use to the consumers. The unit weighs 89 pounds which is not much high. However, Excell included two tires in this unit for enhanced flexibility, mobility and maneuverability. As you are cleaning, it will be easy for you to move the cleaning tool from one place to another when there is the need for that. If the engine is on or vibrating, the tool will not fall down because it is well balanced on the ground with a rubberized stand created with a metal for durability. It has an on-board 1.4 gallon soap storage container where you will put all your cleaning solution including the detergent. So, everything you will need for cleaning is within your reach. The product comes with an ergonomic wand with rust resistant ability. Embedded in this feature are 5 quick connect nozzle tips each suitable for cleaning a particular application. They are color coded to make them distinguishable from each other. With such color coding, you will be able to identify them easily anytime you want to change from one tip to another for use on different applications. As at the time of this review, this product has got just few reviews in Amazon. Unfortunately, the feedbacks are not very great. The consumers are not very satisfied with the product. However, given that this product is from a reliable brand, we hope that subsequent buyers will have great experience with PWZ0142700.01. Excell PWZ0142700.01 is a gas powered pressure washer and thus it is capable of producing high torque which can get rid of dirt and debris. It is suitable for home cleaning. Though, it has not got many reviews, there is no reason to doubt its efficiency. Are you looking to shop for the best pressure washer? If yes, then you should visit our site to read informative reviews. Our reviews are well researched and are geared towards helping you to make an informed decision.